Let’s face it, a trip to the Big Apple isn’t complete without sampling the best of the city’s street food. Bagels, pastrami sandwiches, hot dogs, falafel, lobster rolls and of course the city’s world famous pizza are just some of the must-try delights when you visit. Hot dog stands can be found on every other street corner and are a NYC staple, we never go past a classic ‘water dog’ with ketchup and mustard. 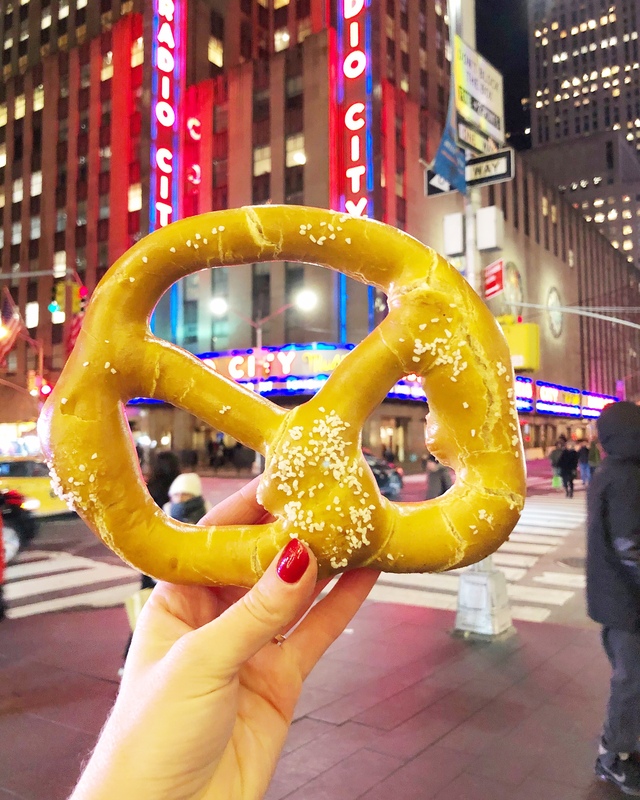 Delicious giant pretzels covered in salt also shouldn’t be missed, they are easy to find and great to grab when you are out and about to get you through to lunch or dinner. Chewy, doughy bagels smothered in cream cheese are our breakfast of choice when we are in New York and while they can be found at many street carts we still love to head downtown to Russ and Daughters for a traditional and delicious bagel with cream cheese and lox. Milk Truck is another of our favourites for American classics such as Mac n Cheese and Red Hook Lobster serves up the most delicious Maine lobster rolls piled high with a touch of mayo that will have you dreaming of a New England getaway. But for the king of all ‘on the go’ foods you can’t go past a slice of New York pizza – huge slices and thin crusts topped with a layer of tomato sauce and full fat mozzarella cheese it ticks every box – delicious, quick and cheap (often only $1 a slice!). On our latest trip to NYC we also came across a stall selling raw choc-chip cookie dough in Bryant Park which is now on our must-try list. Next time you are in New York make sure you try some of the wonderful street food, it’s cheap and delicious (maybe not healthy but hey it’s a holiday!). Want more New York? Click here for a great shopping destination and here for New York from above. Looks delicious! Some day we will make that trip! The food looks good! I have never been to NYC, but it is on my list to visit. Thanks for sharing this! Seems like you enjoyed some great food!